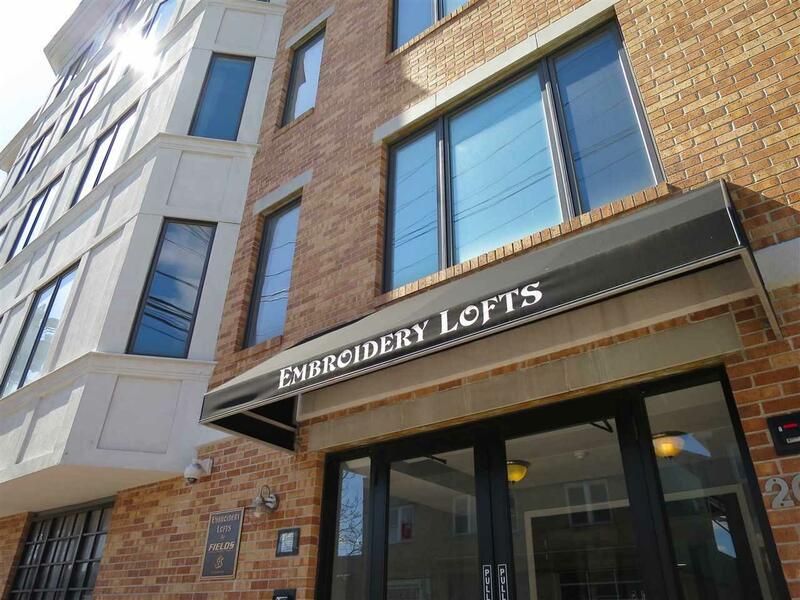 Modern and bright Embroidery Lofts 2 bedroom, 2 bathroom condo spanning 1265 square feet with included deeded parking is just steps to NYC transportation. The kitchen, dining and living room are a spaciously delicious place that makes you feel simply fantastic by the scale, the fabulous finishes of oak hardwood floors, granite counters including a commanding breakfast bar with pendant lighting, stainless appliances, travertine backsplash and bright windows where you will find a special bonus view. The beautifully large master suite has a sizable walk-in closet and private bath while your additional bedroom and bath are generously sized as well. Washer and dryer are in your home as are recessed lights, plenty of closets and central air. Nicely located with easy access for commuters to NYC, Hoboken or other Northern NJ communities. The waterfront is less than a 20 minute walk and you'll find coffee shops, shopping and restaurants all close by.